Need a break from studying? 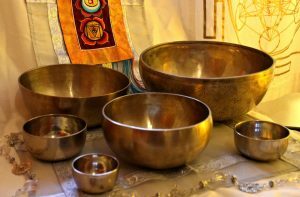 Join us this Friday, March 23 at 7 PM for a restorative demonstration of Himalayan singing bowls by CCM’s Ken Glowacki. At this evening sound bath, you will experience a gentle release of tension and gain re-alignment as you let the soft sound of singing bowls, gong sounds and bells surround you and pass over you. Come with a yoga mat and pillows or use the chairs in the library. It will be a great way to start your weekend.